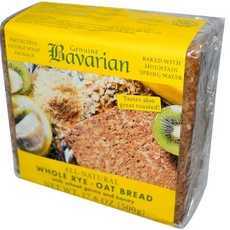 Enjoy Bavarian Breads, Whole Rye-Oat Bread. Kosher Parve. Certified By Bcs. Protective Double Wrap Package. Baked With Mountain Spring Water. Tastes Also Great Toasted! All-Natural. With Wheat Germ And Honey (Note: Description is informational only. Please refer to ingredients label on product prior to use and address any health questions to your Health Professional prior to use.